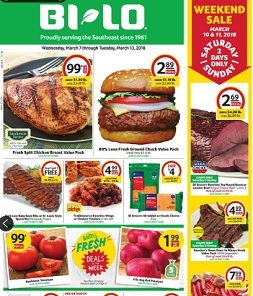 Best BILO weekly sales, valid April 17 – April 23, 2019: $.99 lb Fresh Split Chicken Breast Value Pack; $2.89 lb 80% Lean Fresh Ground Chuck Value Pack; B1G1 free Pork Loin Baby Back Ribs or St. Louis Style Spareribs; $4.99 lb Traditional or Boneless Wings or Chicken Tenders; 2/$4 SE Grocers Shredded or Chunk Cheese; $.99 lb Beefsteak Tomatoes; $1.99 5 lb. Bag Red Potatoes; B1G1 free Domino Granulated Sugar; B1G1 free Mueller’s Traditional Pasta or Ragu Pasta Sauce; B1G1 free 12 Pack Yoo-hoo; B1G1 free Mayfield Select Ice Cream; $1.99 Lance Cookies or Crackers; B1G1 free All Entenmann’s Sweet Goods; 5/$10 Hot Pockets; 3/$10 8 or 12 Pack Coca-Cola Products; 4/$18 Doritos or Ruffles; $4.99 Cottonelle, Scott Bath Tissue, Scott or Viva Paper Towels; $10.9 Tide Liquid Laundry Detergent; $1.99 Broccoli Bunch; 2/$4 Strawberries; $6.99 6 Inch Tulips or Hyacinths; and more. Find all deals and offers in the latest BILO Weekly Ad for your local store.